We have made our first video slideshow and posted it on youtube. Soon to be seen on a website near you! #credit where it is due! 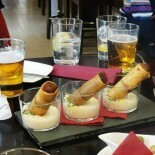 I do like YT’s embed function – http://thisisspain.info/costa-del-sol/malaga/gourmet-tapas-tours !!!! This entry was posted on January 11, 2014 by Tapas in Malaga in Málaga, Tapas, Uncategorized and tagged Andalucia, Guided Gourmet Tapas Tours in Malaga, Guided Tours in Malaga, Malaga Shore Excursions, Málaga, Monumental Malaga, Spain, Tapas. How to spend a couple of hours "under" Antonio Banderas! Semana Santa in Málaga. Another Gem of a Restaurant in Málaga - El Tres. Boutique Hotels in Spain A wonderful collection of personally inspected and reviewed Boutique Hotels in Spain, Morocco and Portugal. Wedding Planners in Andalucia The Wedding Planners in Andalucia who really care.